on the server go to work on that query. The purpose of all these processes is to manage the system such that it will provide your data back to you, or store it, in as timely a manner as possible, whilst maintaining the integrity of the data. When you pass a T-SQL query to the SQL Server system, the first place it goes to is the relational engine. As the T-SQL arrives, it passes through a process that checks that the TSQL is written correctly, that it’s well formed. This process is known as query parsing . The output of the Parser process is a parse tree, or query tree (or even sequence tree). 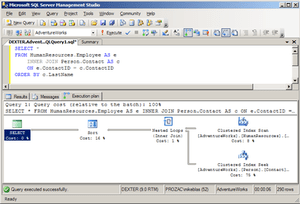 The parse tree represents the logical steps necessary to execute the query that has been requested.